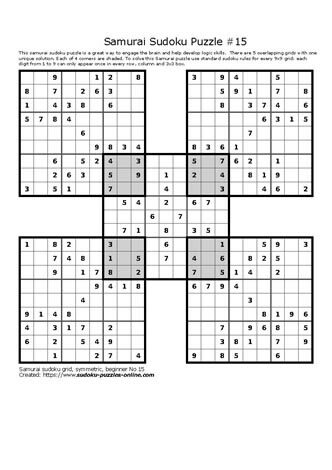 These extreme Sudoku puzzles (also know as Samurai Sudokus) provide great brain workouts, which in term supports brain health. These brain teasers require logical reasoning and understanding basic Sudoku rules to solve for its unique solution. l. Only digits from 1 to 9 are used in this puzzle. 2. Digits can only occur once in each row, once in each column and once in each of the 3x3 grid. This excellent brain game is a series of 5 interconnected 9x9 grids. Challenge family and friends to this puzzle by downloading, printing and solving.